There is a new post that re-releases the script as a Firefox Plugin. Find it here. At the suggestion of Avinash Kaushik, the new script works for keyword data, helping you see how organic search traffic is changing. An increase in a keyword may indicate a general change in user interests and/or improved performance on search results. My coworker Pete Skomoroch also suggested that I add the ability to see declines in referrals and new keyword searches. With the help of Paul Irish, the script is now better able to interface with the date widget on the Google Analytics site. When you click the button, your browser will download some historical data behind the scenes, and display a nice summary of the best and worst performing keywords/referring domains. If you don’t already have Firefox, install it. Install Greasemonkey, and do the required Firefox restart. You should see a handsome monkey peeking at you from the bottom right hand corner of your browser. Open the script file in your firefox browser, and Greasemonkey should give you an option to install the script. Afterwards, log into Google Analytics, and navigate to your Referring Sources or Keywords Tab. Click the button. We spent some time trying to find convenient default settings here at Juice Analytics, so the script should work straight out of the box. Some users, however, may find it convenient to alter some of these configurations. To do so, in Firefox, go to Tools=>Greasemonkey=>Manage User Scripts..., select Google Analytics Downloader, and then click Edit in the lower left corner of the window. This should open up the script file in a text editor. If your computer does not have a default text editor configured, you may have to choose one. ’c:\windows\notepad’ is a good bet for Windows machines. The bracket labeled ’keywords?’ controls defaults for the Keywords page, and correspondingly, ’referring_sources?’ controls the Referring Sources page. To change the settings, simply change the corresponding variable to your preferred default. Make sure to refresh your Google Analytics webpage, if you have it open, so the new settings are loaded. 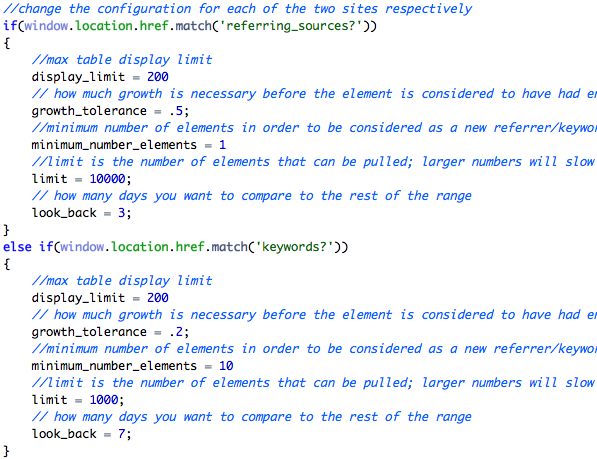 display_limit: This controls the maximum entries that each table will contain. This may be useful for large, sprawling sites. growth_tolerance: This is the percentage growth parameter. Changing it to .10, for example, will catch everything that has grown by 10%, as opposed to the default 50% and 20%, respectively. minimum_number_elements: This is a significance benchmark that can be used to limit what is displayed upon the screen. By default, only keywords with at least 10 elements are displayed upon the screen. Referring Sites does not have a minimum by default, but one can be set if desired. limit: Limit is more of an internal parameter that determines how many entries should be downloaded from Google in order to get the results that are visible here on the page. Lower the limit to increase speed. If the limit is set to a very high number, you will get the largest result set, but you will have to sit around for a while for the results to load. Since the results are downloaded ordered by volume, raising the limit from the default numbers will not actually give more significant results. You will simply get more of the smaller results, such as keywords with only 1 hit. look_back: This is a very important parameter. The script uses the date displayed upon your Google Analytics page to determine the full range that you want to consider in your results, but ’look_back’ determines how many of those days are used for the significance test. So, say the range you have displayed in Google is March 23 - April 22 and your look_back is 7 days. The script will compare the average referrals for a given keyword from April 16-22 to the average from March 23-April 15, and will return the keyword only if the recent average is 20% higher than the rest of the time period. Thus, if you want to increase the total range of the data, change the dates on the actual webpage. Change ’look_back’ only if you want to change the period of significance. My boss Zach has a problem. Every four hours the craving strikes him. No matter where he is, he pulls out his shiny Macbook Pro and navigates to Juice’s Google Analytics site. He pulls up the list of referrers to our site and meticulously searches for new domains. He has an freakish ability to pick out IP addresses that have never linked to us before. Even so, there had to be a better way. After poking around the subtleties of the Google Analytics interface, I came up with a little script that can identify the new referrals that Zach so desperately craves. When navigating to the "Referring Sites" section of Google Analytics, the script add the following button to the interface. The first table shows any sites that have displayed more than a 50% increase in visits over the last 3 days as compared to the rest of the time range. The second shows all new recent sites that do not appear at all more than 3 days ago. This can be quite useful to anyone, who, like Zach, absolutely needs to know about any new and exciting inbound links. 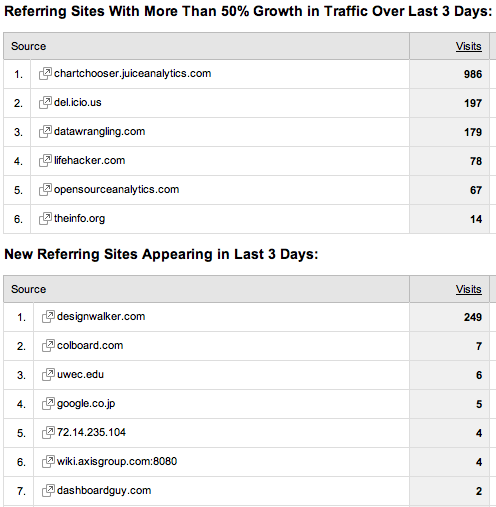 Afterwards, log into Google Analytics, and navigate to your Referring Sources Tab. Click the button.